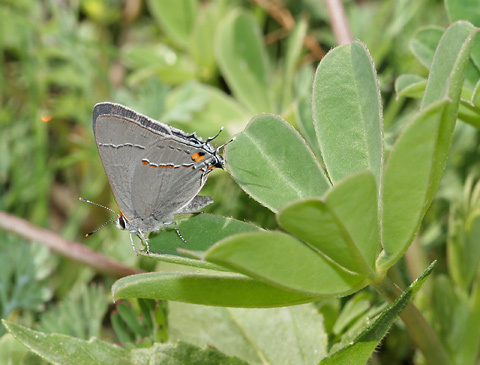 I didn't see too many butterflies in the drought-stricken spring of 2006 in Tucson, Arizona, but given how common Gray Hairstreaks (Strymon melinus) are here in Tucson, I was not surprised to see one already emerged by February of 2006. Even though the spring of 2006 was dry and brown, this dainty gray butterfly had happily managed to find some blooming native wildflowers in the Tucson Botanical Garden's wildflower garden. The Gray Hairstreak rested for a moment between flowers on a lupine leaf, where it did something unusual for a hairstreak butterfly, it opened its wings while perched and allowed me to get a photograph of its dorsal wing surfaces! As soon as they land, these butterflies will usually close their wings, so I had never realized how hairy their backs are, or how much darker their dorsal wing surfaces are when compared to their pale gray ventral wing surfaces. 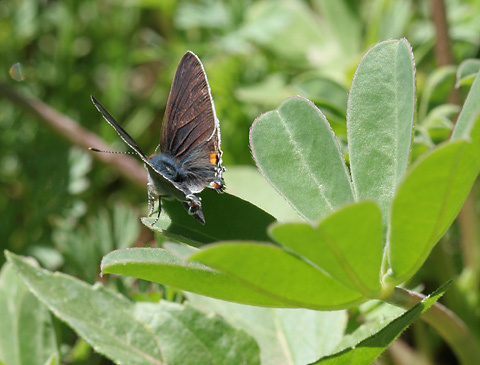 Now if I could just find one of the more colorful hairstreaks that was as cooperative!